After the death of Yukishiro Tomoe, Himura Kenshin became a free wielding swordsman to protect members of the Ishin Shishi. 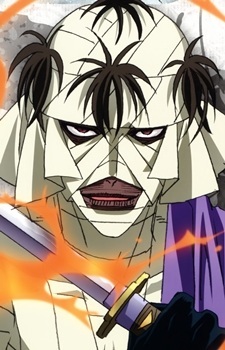 Shishio Makoto became his successor as the shadow hitokiri (assassin) and was responsible for the assassination of Izuka, the man who had betrayed the shishi. The future Meiji government was more secretive about Shishio than Kenshin; many members of the Chōshū and Satsuma clans (the members of the future Meiji government) would have very little information on him. Later, the new Meiji government believed it would be in their best interests to eliminate Shishio before he became too powerful since Shishio was a man who desired power. Thus during the Boshin War, Shishio was rendered unconscious by several gunshots, doused in oil and burned alive by the new government formed by the Ishin Shishi. He survived, sustaining severe damage to his entire body. Afterwards, he assembled a group of the best fighters in Japan, called the Juppongatana (Ten Swords), to overthrow the Meiji government. Shishio envisioned a Japan ruled by him, enforcing the principles of natural selection, or what he called "the strong eat the weak". Using this belief he ran a campaign against the Meiji government, as he felt it was too weak to effectively lead the country. Using his motto, he molded an ideological disciple out of Seta Sōjirō, who served as his right-hand man, and the strongest of the Juppongatana. He planned to strengthen the economy with petroleum once he took over the country. Whether scoundrels you hate to love or antagonists you love to hate, villains are often the most colorful and entertaining characters in a series. Here are a few of anime's best bad guys (and girls). Philosophy is a common storytelling device in anime. Every character lives by their own moral code and follows their own rules, but where might some of these personal codes fall when compared to real life philosophical schools of thought?